You’ll need some Plasticine, Drano, water, GLOVES! !, a lot of paper towels and wood skewers and GOOD VENTILATION. Start the ventilation and open a window or door. Use the Plasticine to create a dam about .25″-.5″ high around the area in the oven you’re looking to remove the aluminum from. The areas you’re working in should be about 2.5″ in diameter. Pour some of the Drano into the dam and add enough water to touch all the sides of the dam. If the chemical reaction hasn’t started (should be almost instant), keep adding the Drano bit by bit until it does. The dam contents will start to boil and ammonia fumes and a little hydrogen gas will form, hence the need for some good ventilation!! Once the reaction is done, poke around with the wood skewer to see if the oven bottom is clear. If you’re satisfied with the results, add some some vinegar to help neutralize the solution a bit, then use the wood skewer to remove the Plasticine dam to a dish to be rinsed off ASAP. Use paper towels to wipe up the mess on the bottom of the oven. See your results! The area of the oven bottom you treated should be free of aluminum and just be discolored instead. Not from the Drano, but from where the Teflon bonded. Repeat the process until the oven bottom is clean. To get a ‘feel’ for the chemical reaction and what to expect, experiment first! Take a square of aluminum foil, go to the backyard with the foil shaped into a little bowl, place it on a dish or pan, add some Drano crystals to it then add a little water. Step back from the dish and try not to breath the fumes! The dish will be hot!! It took me about six hours to clean the bottom of my oven when this happened to me. AND HERE IS THE BUT... There is a mark that is identical to the aluminium shape left after the aluminium has gone. It is raised to touch and a dull black colour (looks silver in the image because of the camera flash). I do not know what it is composed of but I want to remove it. Does anybody know how? (P.s. 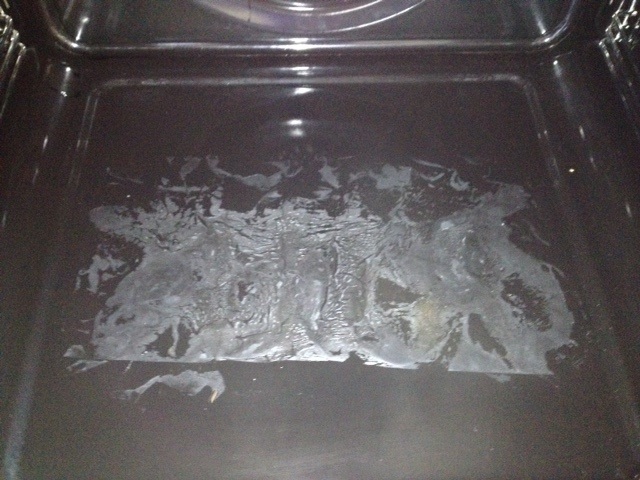 This is a new oven and I'm not going to scrape it off even if it will come - not my oven). Reading through the comments following that procedure you cited, the original author of that article suggested an application of naval jelly (from the paint department at your local hardware store) as the solution that actually worked. Naval jelly is pink goop containing phosphoric acid that is used to remove rust from iron or steel, leaving a clean surface. Bonus solution: The original article also claims that the entire bottom plate can be replaced usually for less than US$30.00. Contact your manufacturer for a replacement part and guidance on installing it. That is still aluminum, evidenced because it's still raised some. It's dark because it is somewhat anodized. You'll have to keep trying UNTIL the process stops causing a reaction each repeated step. This is a lesson I had to learn, never use aluminum foil to catch drips. Use a cookie sheet instead. Not the answer you're looking for? Browse other questions tagged oven or ask your own question. How do I remove aluminum foil from the bottom of my oven? Safe to leave oven on at 180F while at work to cook ribs? What consistency should flan have when it is removed from the oven? What is the purpose of wrapping fish with aluminum foil? How to imitate the oven on the stovetop? Can I still use my oven, even if it has melted aluminum foil stuck to the bottom?